The Kilkenny and Tipperary teams parade before their Allianz HL Division 1 final clash at Nowlan Park. Tipperary were 'simply awful' against Kilkenny yesterday, according to Ger Loughnane. Writing in his Irish Daily Star column, Loughnane was critical of Tipp's defence and their over-reliance on Jason Forde and John McGrath in attack. "This wasn't a game of championship pace or intensity, and Tipp were simply awful," he stated. "They had four players in the forward line that, if you were playing against them in a club game, you wouldn't worry. Tipp were totally dependent on Jason Forde and John McGrath up front. 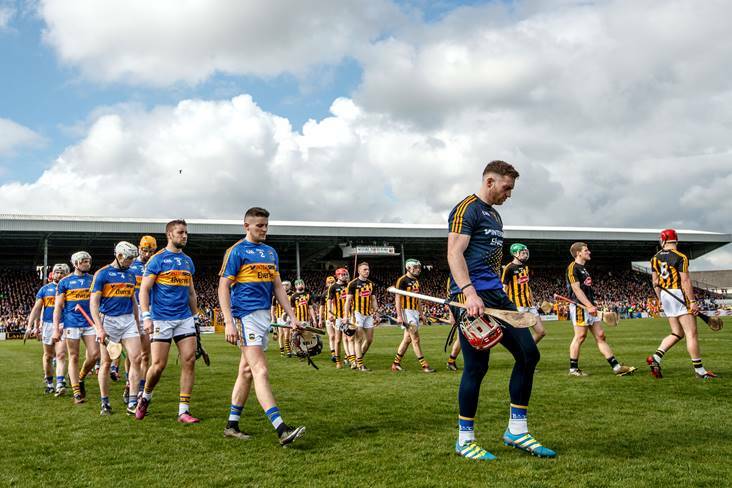 "You look at the Tipp defence and the lack of pace is such a huge problem that you wonder if they can survive in the summer without making adjustments. Look at the scores they're giving away - 2-23 yesterday, 1-31 against Limerick. You can't do that and expect to win. "But by far Tipp's biggest flaw is their inability to compete under the high ball, let alone win it. That's a problem all over the field, but it's especially pronounced in the full back and half forward lines. "The Tipp we saw yesterday have so many flaws that Michael Ryan must be very worried."